Laminated Kerbside Collection Sacks are ideal for collecting newspapers, cardboard, cans, glass or plastics. Laminated, UV resistant, wipe clean Woven Polypropylene bags in Blue or Green 47 litre in stock – supplied plain or with basic overprinting. Special sizes colours & prints to order (min quantities & lead times apply). An alternative to boxes at a much lower price. We can even supply them with rubber Anchor Pads so they stay put when empty. 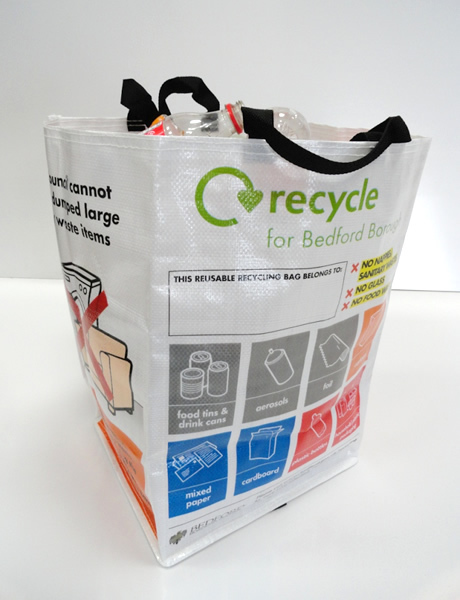 Our laminated recycling bags are durable, high quality sacks for kerbside recycling. 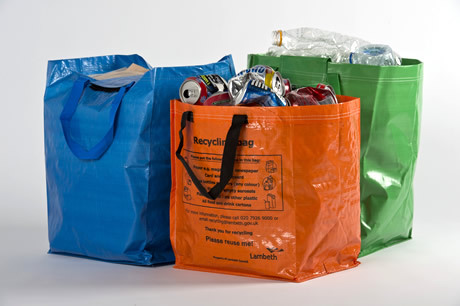 These laminated bags are ideal for collecting almost all recyclable material. Our laminated recycling bags are easy to carry, clean and store. Kerbside recycling sacks can be provided with overprinting making them ideal for local authorities and recycling companies.